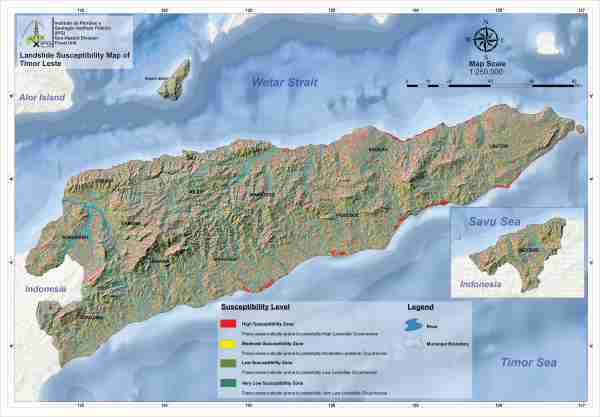 Map shows the susceptibility level of Landslide occurrences in Timor-Leste. Red Color shows, the High Landslide Susceptibility occurrences, Yellow color shows, the Moderate Susceptibility of Landslide, the Pale Green and Dark Green color shows, the Susceptibility occurrences of Landslide which is, from Very Low to Low level. For more information and high-quality resolution of the Map, please feel free to contact the IPG office, at Rua, Delta I, Aimutin, Comoro, Dili, Timor-Leste, Office Number (+670-3310179).